The idea for my 2013 California Health Journalism Fellowship project was bubbling long before our first reporter headed to the Central Valley to tell stories from the high school dropout crisis. I'm the senior producer of Capital Public Radio's multimedia documentary series, The View From Here (TVFH). Our mission is to explore "the stories of people responding to challenges in their lives and the challenges of our times." We saw that the Corporation for Public Broadcasting's nation-wide American Graduate project was rolling out media from California's urban, coastal cities, but there was little reporting from arguably the hardest hit region of the state: the Central Valley. CapRadio's signal reaches a good chunk of that region. We have a stringer in Stockton who files hard news, but here was an opportunity to connect with that community in a more meaningful way through a documentary project with a mission to "reflect the diversity of our community, telling stories in a human way: first person and character driven." The data are devastating. Three high schools in Stockton and four of Fresno's high schools made a 2004 list of "dropout factories" where 50% of freshmen failed to complete school through their senior year. California Department of Education data show that African Americans, Latinos, Pacific Islanders and Native Americans consistently have higher dropout rates than Asian Americans, Filipinos or whites. And the overall dropout rates are typically higher in schools where a large percentage of students qualify for free or reduced-price lunch. Low-income students of color from under-resourced communities in the Central Valley seemed to be dropping out more and graduating less than students elsewhere in California. Our question was "Why?" We named our project Class Dismissed and geared up to send three reporters and a multimedia producer into the field for several months to find out what was happening in the schools, neighborhoods and homes of failing and at-risk students. But without already established community connections, we wondered how deep and real our stories could be. From the beginning, Class Dismissed was more than media. As part of The View From Here's ongoing commitment to innovation and experimentation, I hoped to demonstrate the value of incorporating community engagement as a key component of a major reporting project. Despite the steep learning curve, financial costs and initial concerns for journalistic integrity, News and Information Director Joe Barr says that community engagement will continue to be part of The View From Here because it "provides new ways to inform our journalism, connect with more diverse voices and have impact in communities." Each milestone in this project was achieved through the dedication and skill of project team members, including our ten community partners. Part of my job as senior producer is to make sure that each member of my team has the resources to do their best, and then some. I support them. I push them. I learn from them. Here's some of what we learned from each other during Class Dismissed. Think big. Build the necessary strengths for ambitious projects. Projects like Class Dismissed require heavy lifting. It takes a team of about 20 people to accomplish each project. Reporters, producers, editors, interns, digital designers and department directors must all push hard and contribute at their highest levels to complete a successful project in images, audio, radio, video and social media. It took CapRadio two years of experimenting and innovating over the course of four documentary projects before we truly found our "voice." CapRadio's News Department was given extraordinary latitude from the highest levels of the organization. During that time we brought in a national production consultant to help us articulate our goals and define our processes. These "blue sky" meetings resulted in a name that resonates with our goals, The View From Here, and a Mission and Code that is our compass, providing direction for all we do. "Community Engagement is working collaboratively to discover, understand and give voice to community needs, values, and aspirations." Through community engagement convenings, the TVFH production team formed fruitful, working relationships with dozens of parents, mentors, teachers, students and community leaders involved in improving the wellbeing of youth in the Central Valley. Make stories that ring true in the community where those stories live. The community engagement convenings of Class Dismissed were open to reporters, producers and editors. Reporter Julia Mitric (pictured above at a gathering at Fathers and Families of San Joaquin) listened as teachers, parents and students responded to a clip of an interview she conducted with teen mom Unyque Jackson. "It impacted my reporting to hear all of you from diverse communities say, 'Yes this is happening here and we actually didn't think anybody cared.' To me as a reporter it was just super powerful because it gives a reality check on my work," said Mitric. "People didn't even know where [Capital Public Radio was] on the dial and they might now be listening and they might have something to contribute both to the dialogue and to the kind of coverage that is on public radio. As journalists it makes us more accountable to our communities and to the public that we are supposed to be serving with our media." Reporter Rebecca Plevin attended a gathering at Building Futures Academy in Stockton. She got interested in restorative justice and found a story. But, after investing a few weeks of reporting, it clearly did not fit our focus. (She finished the story for Valley Public Radio.) With editor approval, Rebecca switched to a different story. She learned to "Take the time to find the right subject: That was probably the biggest challenge I faced, and I'm glad I kept searching for someone whose story felt important and universal, and who could tell it well." A documentary project has its advantages: extended time with a subject to build trust and dive below the surface of a story. But staying in touch with young people over several months and throughout the summer proved challenging. The TVFH team approach supported reporters to stick with their stories, find creative ways to tell those stories with strong audio scenes and work around problems that arose. Rebecca found Geronimo Garcia through a faith-based outreach program. His gang intervention specialist, Manny Castro, became her cultural liaison and safety advisor, accompanying her on interviews. "The challenges of reporting the story may be PART of the story: My lack of access to Geronimo's life became part of the story, and not just a hindrance," said Plevin. "I think it reflected how much of his life was underground, and how difficult it would be for him to pursue a degree." The Class Dismissed stories rang true with our community partners. At the project wrap-up party, Sammy A. Nunez, Executive Director of Fathers and Families of San Joaquin offered a big picture perspective on the importance of raising youth voices in the media: "When you discover your voice as a young person and when you are able to tell your own story, you'll never be the same again. This is important. This is significant. This is a way...of healing. I think Martin Luther King said, 'Violence is a tool of the inarticulate.' Finding a way to have your voice actually decreases violence. I'm eternally grateful for giving us the opportunity to tell our story." Collaborate like you mean it. 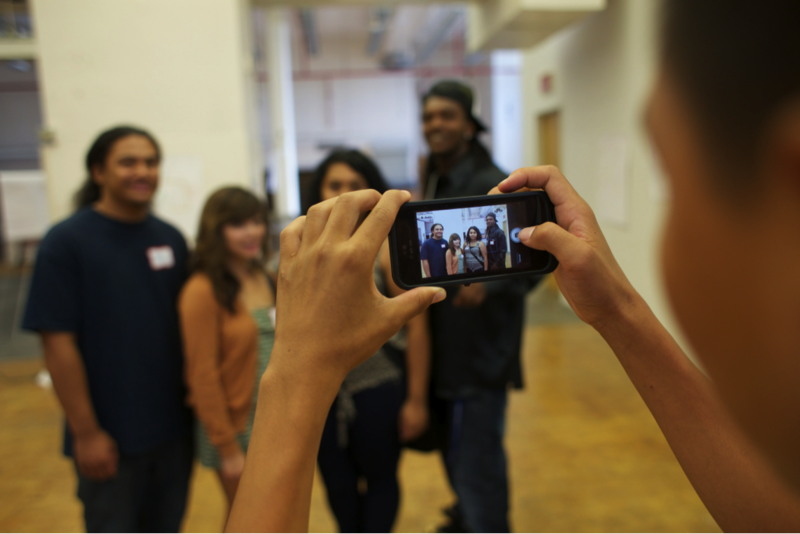 Take the time to build real relationships between media makers and community members. The task for public media in building community relationships is to be a partner that is worthy of community trust. We have a lot to prove in communities where residents have never heard of public radio. One partner told us she had always thought public radio was something political until CapRadio invited her organization to a community convening in Stockton. Even though she lives in our broadcast area, she only started listening as she became involved in the Class Dismissed project. Now, she's a champion for Capital Public Radio. This did not surprise Community Engagement Specialist jesikah maria ross. "Communities want to be heard and when they are invited into the media making process in a respectful, intentional, and reciprocal way, they will transform into loyal public radio advocates," she said. Her expertise in both media making and community development was crucial in navigating the tricky terrain between journalism and advocacy. Just how to find that balance was an area of valuable discussion between ross and Joe Barr, Capital Public Radio's director of news and information. Barr believes the result allowed the project to have even more impact. "This community engagement initiative showed a new way for a news organization to have impact," said Barr. "This was journalism and community development without broaching ethical firewalls. The process informed our reporting, infusing it with diverse voices and different perspectives that we otherwise would not have had. It harnessed Capital Public Radio's role as a convener, bringing people and organizations together in a catalyst for collaboration. Moving forward, we want to continue to develop our community engagement efforts so that Capital Public Radio News will be a true reflection of the diverse world around us." Be the best radio you can be. But, be more than radio. The one-hour documentary was broadcast on Capital Public Radio's four news stations and streamed online September 20, 2013 and re-broadcast on December 20, 2013 reaching many tens of thousands of listeners in northern California and western Nevada. It has been aired on other stations throughout California as well as in New York and Illinois via the Capital Public Radio Network and the Public Radio Exchange. Pages on the Class Dismissed website (part of capradio.org) have been viewed 4,200 times and the on demand audio of the one-hour documentary has been played 700 times. CapRadio's daily talk show, Insight with Beth Ruyak, was broadcast with a live audience at the Long Theater at University of the Pacific in Stockton immediately following the documentary airing. More community engagement. Magazine-length Web narratives expanded on the stories in the radio doc. Each was illustrated with SoundCloud audio clips that allow us to count plays and sharable, countable YouTube videos and Flickr photo galleries. J-school interns curated the @CapRadioView Twitter feed. We added more than 125 followers during Class Dismissed. · CapRadio's community engagement specialist facilitated monthly community convenings and three youth media workshops in parallel with the documentary production. 10 community partners from Stockton collaborated on Class Dismissed. They say they will continue working together after the project wraps up. 96 youths filled a community blog RView209 with photos, audio and video. 422 residents of San Joaquin County attended 34 community dialogues 209Talks where they listened to media clips that sparked conversations about how to improve youth wellbeing. The Class Dismissed website offers a free, downloadable discussion guide with step-by-step directions and media resources for facilitators of community dialogues. It has been shared with youth educators and organizers in several states. Capital Public Radio and TVFH are able to do much more than radio because of the talent, skills and vision of our project team. We do it because we believe it's the way to tell authentic stories that will connect with our core audience as well as new listeners, viewers and readers. BONUS LESSON: Always give credit where credit is due. Never underestimate the power of collaboration.